Thirty-five high schools in the state now have fake grass fields. Al Hartmann | The Salt Lake Tribune Corner Canyon High School football coach Donald Eck likes the new articial turf on the school's football field. 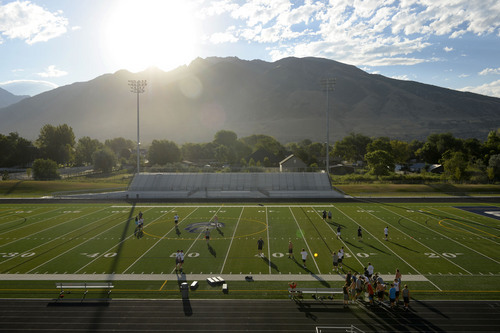 Al Hartmann | The Salt Lake Tribune Sunrises over the mountain onto Corner Canyon High School's football field with new artificial turf. Football pads drenched in sweat and mud streaked with grass strains on the knees. But this classic scene is slowly disappearing from high schools in Utah. More and more programs are switching from grass fields to artificial turf in a bid to enhance their financial bottom lines. Of the 103 high schools in Utah that have football programs, 35 now play on some kind of artificial surface. Olympus, Provo, Murray and Clearfield are all schools that have converted to turf recently. Corner Canyon installed the fake grass when it opened last year, and Orem is installing turf this summer, in time for the start of the 2014 season. The major concern for most programs is the startup cost. According to Field Turf, a company that installs artificial grass, the estimated cost of installing a turf field is $320,000. A grass field, by comparison, costs $150,000 to put in. But while the initial outlay may be steep, schools officials argue that they save money in the long run because artificial turf costs a fraction of a grass field to maintain, and allows for multiple uses of the field. "As a coach, it&apos;s nice to get to practice on a field and not have to worry about chewing it," said Orem football coach Tyler Anderson. The Tigers&apos; field is scheduled to be complete on Aug. 20, in time for their first game on Aug. 22. There is little to no daily upkeep with turf fields. They are designed with lines and logos, and usually include a drainage system in case of inclement weather. "Turf is a better option, because I get more traction and it&apos;s more dependable," said Branden Bowen, a senior offensive tackle at Corner Canyon. "I have friends who play for Brighton and they have grass. They are praying that they get turf one of these days." However, the biggest benefit of artificial turf is probably this: The fields do not exclusively benefit football programs. The soccer, rugby, lacrosse, baseball and softball teams can all utilize the field. Community events can also be held on them. And injury problems, which were the biggest argument against playing on artificial surfaces when they were originally developed in the 1970s, have been sharply curtailed. 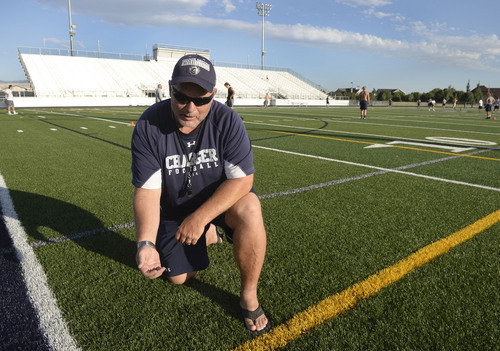 Corner Canyon coach Don Eck, a former Utah Ute who played on Rice Stadium&apos;s original carpet in the 1980s, says thanks to improvements in turf technology, the artificial surfaces are much safer than they used to be. "Now you have [fewer] lower body injuries on AstroTurf than you do on natural grass," he said. Roy Trawick, an orthopedic surgeon and sports medicine medical director at The Orthopedic Speciality Hospital (TOSH) in Murray, finds the difference in injuries between field turf and grass is negligible. He said there are no "profound differences" between the two surfaces in the aspect of injuries. The University of Calgary conducted a survey on the safety of field turf last year. The total injury rate of both surfaces combined was 13.7 injuries per 1,000 game exposures. The rate on artificial turf was 14.8, while the rate on natural grass was 12.2. Bottom line: injuries are unavoidable on grass or artificial turf. Players can and will get hurt. But many coaches will gladly give up the watering, painting, mowing and fertilizing the field if it means more time to do what they love  coach. "The smell of the artificial turf isn&apos;t quite the same as freshly cut grass," said Olympus coach Aaron Whitehead, who admits he sometimes misses his days cutting the field grass. "But, not enough to give up the benefits of having artificial grass." Some coaches, like Joe Dupaix of Timpanogos, are just fine with grass. "There&apos;s something about the smell of grass when you&apos;re playing," he said, allowing that his school may, at some point go the artificial route. But others, like Eck at Corner Canyon, are happy to play on the fake stuff, no matter how nostalgic they might be about the old days.